The global melamine formaldehyde market features a fairly fragmented landscape as just 20% of the overall global market share rested in the hands of the leading five players in 2012, finds Transparency Market Research (TMR). These companies are INEOS Group, Momentive Speciality, Borealis AG, Mitsui Chemicals, and BASF SE. Top players are engaged in developing innovative formulations for meeting the demanding requirements of end-use industries across the globe, especially for the paints and coatings industry, which help them stay ahead of their competitors. In addition, several chemical companies in the market are focused on expanding their product range to consolidate their shares. 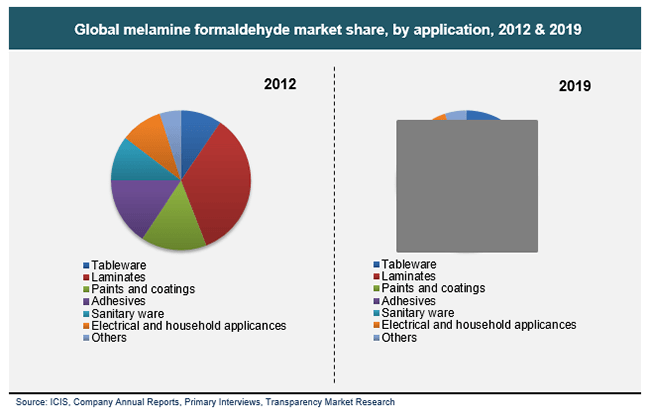 The global melamine formaldehyde market stood at US$13.45 Bn in 2012. Rising at a steady 6.3% CAGR, the market is projected to reach a valuation of US$20.62 Bn by the end of 2019. The various applications of melamine formaldehyde are in tableware, laminates, adhesives, paints and coatings, sanitary ware, and electrical and household appliances. Of all the segments, the usage of the resin in the paints and coatings industry led in 2012. This can be attributed to the rising application of the resin in a variety of coatings. Of all the regional segments, Asia Pacific served the dominant demand accounting for a share of over 40% in 2012. The growth of the regional market is increasingly driven by the extensive usage of the resin in the construction and furniture industries over the past few years, particularly in China which is major exporter of secondary processed products. The global melamine formaldehyde market is driven primarily by the rising usage of the resin in the manufacture of laminates and adhesives. The extensive application of melamine formaldehyde-based products, particularly sulfonated melamine formaldehyde (SMF), in making concrete admixtures is a notable factor propelling the growth of the market. The demand in the construction industry is notably attributed to the attractive water content reducing properties of SMF, which promotes its application for making high-resistance concrete. Furthermore, the potentially attractive demand for melamine formaldehyde in several other end-use industries is on the account of its properties of amazing durability and strength, making it a versatile thermosetting plastic world over. For instance, the remarkable scratch- and impact-resistance that melamine formaldehyde exhibits is propelling its demand in making sanitary ware and household crockery items. Moreover, the rapidly emerging demand for melamine formaldehyde in food packaging applications is another crucial factor reflecting well on the expansion of the market. The rapid pace of urbanizations has led to giant strides in the construction in industry, especially in emerging economies. Coupled with this, the rising need for more functional concrete mixtures that are resistant to aggressive environments is accentuating the demand for melamine formaldehyde. The changing lifestyle of global populations is a key factor underpinning the demand for durable furniture, thereby catalyzing the uptake of melamine formaldehyde resins. The extensive demand for secondary processed melamine formaldehyde-based products, especially coming from China, is a notable factor accentuating the global market. However, the growth of the market is crippled by the large gap in demand and supply of the raw materials. On the other hand, substantial advances in manufacturing technologies in recent years aimed at improving cross-linking of melamine formaldehyde with several other chemicals bodes well for its usage, notably in the paints and coatings industry. For instance, the advent of versatile crosslinking agents made with them are extensively being demanded in making a wide range of polymeric materials. The study presented here is based on a report by Transparency Market Research (TMR) titled “Melamine Formaldehyde Market (Application - Tableware, Laminates, Adhesives, Paints & Coatings, Sanitary Ware, and Electricals & Household Appliances) - Global Industry Analysis, Size, Share, Growth, Trends and Forecast, 2013–2019”.